These decadent Mini Cheesecakes are the perfect sweet treat when you need to satisfy that dessert craving. And at just 2 Points and less than 100 calories each, they will make any Weight Watchers dessert recipe lover a happy camper. I found a traditional mini cheesecakes recipe online, similar to what my mom used to use, and then just subbed out half of the cream cheese for fat free Greek yogurt (seriously, is there any place I can’t use this stuff?!?!? ), and used a light cream cheese for the rest. I also used less sugar and added in some vanilla to help keep it sweet. Also, by using Reduced Fat Vanilla Wafers instead of the regular ones, you get a fantastic mini cheesecake for a LOT less fat calories and Weight Watchers Points. 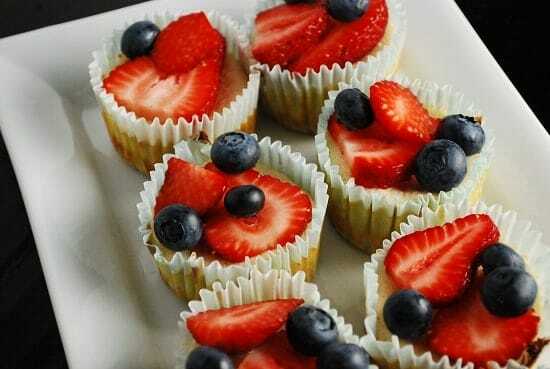 I topped mine with fresh blueberries and strawberries since I was making them for a Fourth of July party and I wanted a Red, White and Blue Dessert, but you can really use any fresh fruit you’d like. I’ve made them with cherries, with mangoes and papaya, and with kiwi. They are divine!! Enjoy. Treat yourself to a decadent mini dessert recipe with these portion controlled cheesecakes. At just 2 Points and less than 100 calories each, these mini cheesecakes are the perfect way to satisfy your dessert craving without the guilt. In a medium mixing bowl beat cream cheese until fluffy. Add egg substitute, yogurt, and sugar. Beat until smooth and thoroughly combined. Bake in oven for 20 minutes. You may have to adjust the time a bit if they still come out too soft or runny. It will depend on the oven. Cool on a rack for about 15 minutes until mini cheesecakes reach room temperature, then chill in refrigerator for at least an hour. Right before serving, top with fresh fruit of your choice. So 3sp for Splenda or 4sp for sugar! Making these with our fresh picked strawberries today! I just made these over the July 4th 2016 weekend. They are scrumptious! I wanted to share a few thoughts. The recipe says the batter makes 12 mini cheesecakes. I followed the recipe to a tee and I was able to make 48 mini cheesecakes! I wanted to share that I used 4 packages of 12 mini nilla wafers instead of the reduced fat regular size nilla wafer, I found that the mini fits perfectly in a mini cupcake holder. One package of the wafers is worth 5 smart points on weight watchers. One cookie is 10 calories and most things on ww that are 10 calories are zero smart points. The fruit you use is also zero smart points. Thank you for the figure friendly dessert! Please give credit where credit is due. This recipe is nearly identical to Gina’s recipe on Skinnytaste. (except for the egg substitute vs. egg whites). If you are going to claim that you “changed a recipe” at least say where you got it from. I just looked at the Skinny taste Recipe, and while most of the basic ingredients are the same (as they are in all cheesecake recipes), there are still noticeable differences. She uses flour in hers, mine does not. She uses less vanilla. And she uses egg whites, whereas I use the egg substitute. Almost all mini cheesecake recipes are extremely similar. For example, look at this one from All Recipes: http://allrecipes.com/recipe/mini-cheesecakes-i/. It has almost all the exact same ingredients as Skinnytaste, except for the yogurt. When dealing with such common recipes as this, it’s really impossible for one person to claim the recipe. Though Skinny taste has some good recipes, I did not use/copy the recipe from her site. It is still very similar and the pictures looks EXACTLY like hers – and hers is an original recipe. I think if you are going to change up a recipe that you find, you should state what specific recipe you are changing, not just say “one from the internet”. Sara, she just told you why it is similar and it is clearly not from skinny taste. Skinny taste did NOT invent this recipe and it is NOT hers. A picture of a similar recipe will look similar don’t you think? If you ask me, it actually looks like skinny taste copied her recipe from all recipes. Anyway, go get a life and stay at skinny taste. Sara…I have a 30 year-old recipe from my mother-in-law who was diabetic. It’s also “nearly identical”…which if you think about it, isn’t identical at all! “Nearly” being the operative word! I agree with Angela…LOL! how it works in the recipe? Or would it not really make that much difference points-wise? Thanks for all the great recipes. I come here first when I am looking for something new and healthy.